Last week, in one of my usual fridge trolling sessions, trying to figure out what would be worth cooking as opposed to ordering Wild Ginger (maybe the world's best vegan Chinese food), I came across a lone brick of cinnamon raisin mochi. It's one of those things I oooh and aaaah over in the supermarket, buy, and bring home, and it sits there forever cause I never go in the fridge to find dessert and feel like it's too "sweet" to use for dinner. That said, it was the perfect garnish for this supersimple, grounding, healing soup that needed a little umph that could stand up to it's inherent healthy deliciousness. In a large soup pot saute the onions in apx 4 tablespoons of the oil. Add the squash and water and bring to a boil. Reduce to a rolling simmer and cook for 45min-1hr until the squash starts to disintegrate. Using an immersion blender, blend the soup to your desired consistency. I like mine a little chunky, but it's up to you how pureed you want it. Once the soup is ready, in a separate pan (cast iron preferably), heat 1-2 tablespoons of the oil. Once the oil is hot, add the mochi filling the pan, but not letting them touch. Cover the pan and let it cook for 2-3 minutes until the bottoms are just browned. Flip the squares and cook, covered, for another 2-3min until the flip side is browned and they start to melt a bit in the center. Serve immediately on top of the soup. That said, a day like that calls for something warming and nourishing. After coming home from an emotionally exhausting day of house hunting, I decided to make use of the local, organic butternut squash I had delivered from Fresh Direct this morning. Paired with some coconut oil and carrots it was the perfect sweet and grounding dinner we all needed! 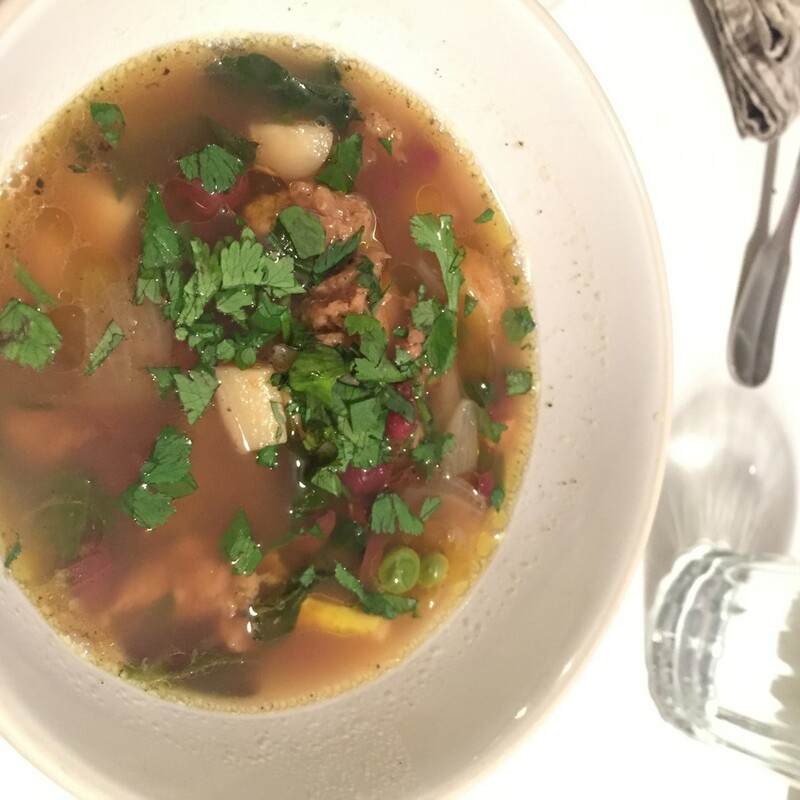 Simple and delicious, make this soup for your family any night and you'll get smiles all around. In a heavy bottom soup pot, heat the coconut oil. Once melted add the carrots and salt and sauté. While the carrots are cooking cut up the squash and separate the seeds. Add the squash and cinnamon and nutmeg and mix to coat. Cook for 10-15 minutes until the vegetables start to soften. Meanwhile, in a dry pan (I like to use a cast iron) cook the seeds until dried and slightly browned. Season the seeds with sea salt. Add the water and bring to a boil then down to a rolling. Let it cook for 30-45 min until the squash starts to break down and soften. Serve with seeds as garnish. Y'all know soups are my thing. And they're especially fabulous when the veggies are ripe and seasonally appropriate. More often than not, my feeling is the simpler the better. Let the fresh flavors stand out and merely compliment them with the right cooking process and spices. Last week I needed to trow together a last minute dinner after coming home from errands too late. I took a peak in my fridge and saw the local, organic yellow squashes and green zucchinis I ordered from Fresh Direct with no intentions. They were lying right next to some leeks and BOOM: dinner. I cut them into large chunks, spread them on a sheet pan with some saute oil, and Himalayan sea salt and popped them in the oven at 425 degrees for 30 minutes until they were beginning to caramelize a bit. Then I stuck them in a soup pot with a carton of no chicken stock and let it boil then brought it down to a simmer. I blended it with an immersion blender and voila!